This is the year of portable computing. As lifestyles get more frantic by the minute, laptops have to work overtime to cater to a myriad of needs with agility, and that’s exactly the promise of the latest ASUS ZenBook 14 UX431FA-ES51/74. 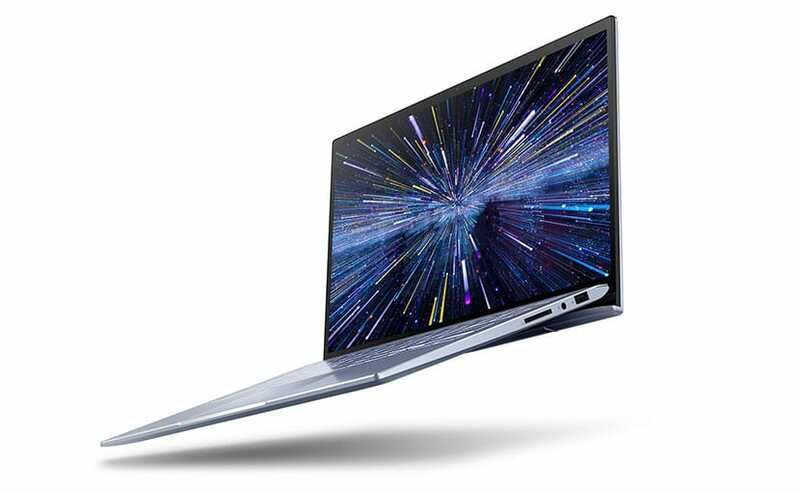 The most recent launch from the ASUS house is a 14-inch laptop designed to be ultra-mobile without compromising on performance. With a weight of 3.2lbs, a thickness of 0.65”, an Intel Core i5 CPU, and a nano-edge FHD display, we daresay the new ZenBook seems to be true to the quintessential, quiet power of its hallowed family. It is currently available in two models—ES51 & ES74—that essentially vary in processing configuration, storage space and battery backup. The prices start at $799 for ES51 and $899 for ES74. Let us review the offerings of this laptop and see if its promises hold water. Fuelling this computer is a powerful Intel Core i5/i7 processor (up to 3.9GHz/4.6GHz respectively), 8GB RAM, and 256GB of high-speed SSD memory. This processing configuration is apt to serve most day-to-day computing tasks comfortably. Note that the ES74 model offers as much as 512GB of SSD storage; it is the recommended model if your processing requirements are more CPU-intense, such as programming or simulation. The operating system in both models is a productive Windows 10 Home with ready tools for professionals and data security. The new ASUS ZenBook also boasts of a long battery backup of almost 12 hours in the ES51 model (and 10 hours in the ES74 model). This is enough and more to last you throughout a standard day at work or school, leaving room for Netflix. The nano-edge design of this laptop is a winner. 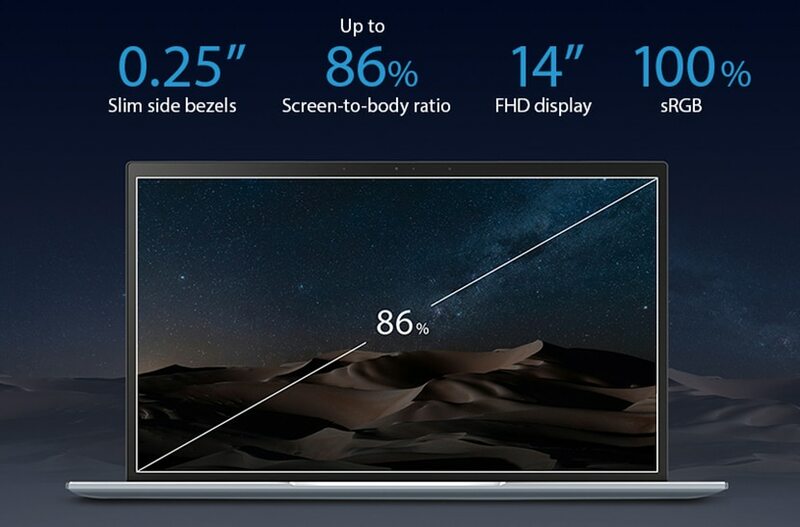 Since the bezel is astonishingly thin at 0.25”, the screen-to-body ratio is almost 86%. This makes all your content immersive. ASUS claims that this laptop is a 14” machine in the body of a 13” computer, and we are tempted to agree. This ZenBook also boasts of a full 100% sRGB color gamut for accurate rendition of colors and a rich, vivid display. The screen resolution supported is 1920 x 1080 which is effective for most content, ranging from high-res photo editing assignments to video games. Note that both the models support Intel HD Graphics 620 (integrated). So, if you have been coveting the razzmatazz of a dedicated graphics card, you might be disappointed. In the sound department, the device benefits from the Harman Kardon audio, complemented by the ASUS Golden Ear and ASUS SonicMaster technologies. The auditory system employs quad speakers to deliver richer sound—two bass speakers, two high-frequency speakers. The resulting experience is enjoyable, with the smart amplifier technology proving especially effective in minimizing distortion even amidst ambient noise. If you plan on using your computer to pursue multimedia activities like video streaming and casual gaming, you will find the top-notch audio genuinely rewarding. 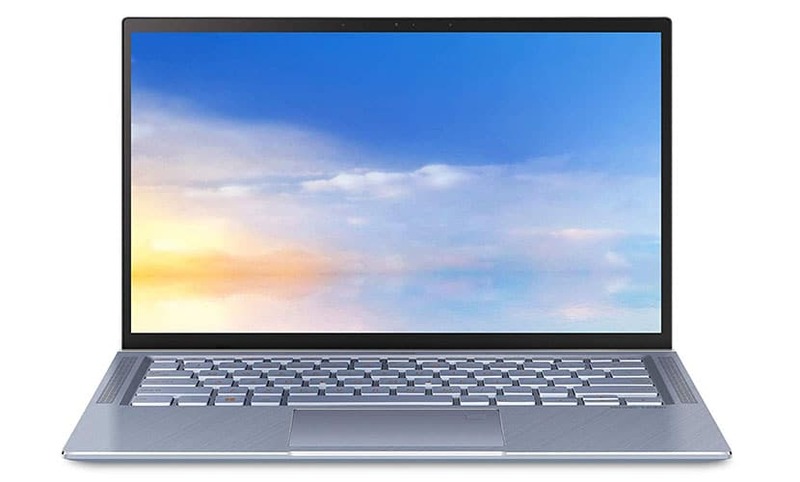 Living up to the expectations from a ZenBook, this newest launch also offers tremendous portability. Its lightweight and slender body makes it easy to carry with you; you can slip it into backpacks or lug it along in a handbag without feeling bogged down by the weight. An ergonomic hinge allows you to adjust the keyboard to a typing position that feels the most comfortable to you. This comes in handy for writers, creative professionals, and anyone who uses the keyboard extensively, often developing backaches and shoulder pains as a result. 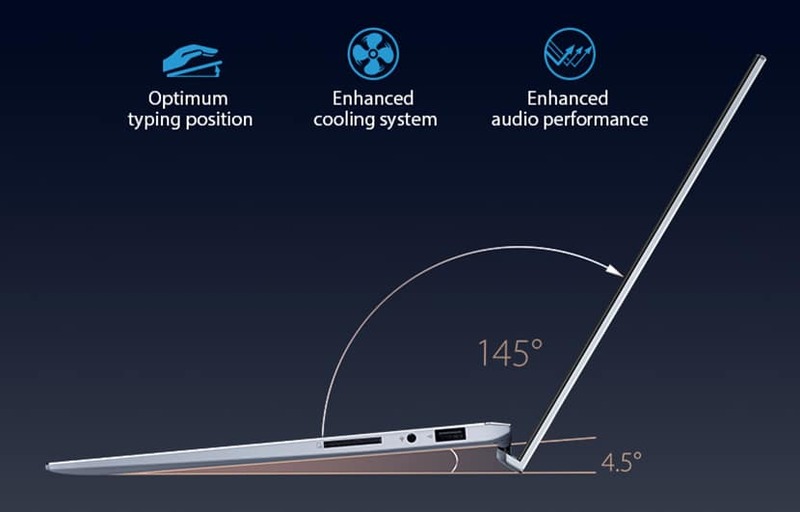 Bonus: The hinge also boosts the cooling system and audio performance of the device. How does the laptop look? This is hardly a secondary consideration in this era of style, but fortunately, this device succeeds in being quite charming with its silver-blue color (“utopia blue”) and silver-trim paneling. The chassis adheres to military-grade durability (MIL-STD-810G), which means you can carry your laptop around without being afraid of transit damage. In fact, ASUS has tested its newest launch extensively with the tests including exposure to drops, high altitudes, and low temperatures. With this ZenBook, you get a fingerprint sensor (with Windows Hello) that lets you log in without the need to type in a password. Talk about simplified access on the run! To enable you to connect to any devices or peripherals you may need, such as mice or external displays, you can use the built-in USB ports (one USB 2.0 port and two USB 3.0 ports) and HDMI. 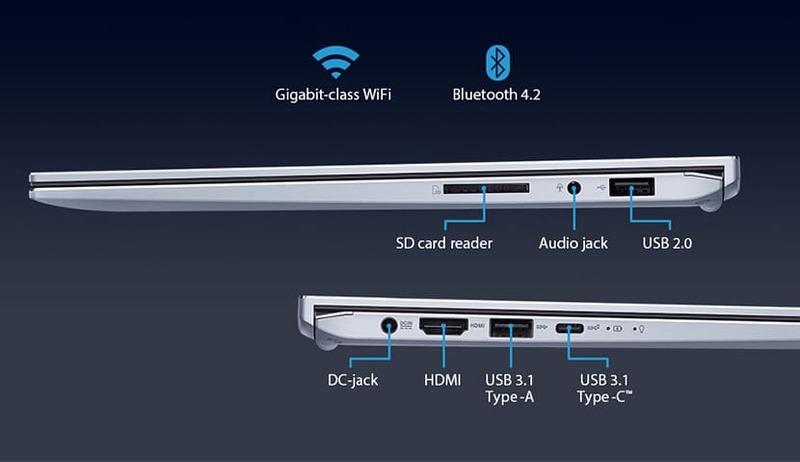 There is an SD card reader too, along with support for 802.11ac Wi-Fi and Bluetooth 4.2. The launch of the ASUS ZenBook 14 UX431FA-ES51/74 is perfectly timed. With the demand for portable, light yet mighty computers increasing by leaps and bounds, ASUS has brought to the table a potent offering that delivers on all these fronts. This laptop travels excellently, with special features to boost its operations on the go, including a backlit and ergonomic keyboard, a superior audio system, and a distortion-free display. Alongside, it also offers a plethora of options for connectivity and device support. This ensures that you can work seamlessly across your office, home or school, sharing data and collaborating with peers and colleagues when required. The availability of two models with varying CPUs, memory and battery life lets you make a customized choice tailored to your needs and budget. Plus, you get to bank on the assurance of the ZenBook brand; over time, this line-up of products has carved an admirable reputation for optimizing performance without cutting corners in mobility or inflating the price point. Three words: Value for money!